Read your own Pro paper's headlines in your favorite RSS reader and offer your readers an RSS feed for the entire paper or just a topic area ! From your Paper Settings Dashboard, click Global settings, then click Get RSS Feed URL. Copy and paste the RSS feed URL into your favorite RSS reader. The RSS feed will include all headline articles for each edition, plus 6 articles taken from the first eight sections. From your Paper Settings Dashboard > Web Newspaper > Layout & appearance then Layout widgets. Turn RSS icons toggle to ON. You will now find the RSS icon on the front page of your paper, next to "Archives". Topic page view example: RSS for a topic is available on a topic page selected from the Topics dropdown menu. Your readers will also find an RSS feed for each topic on the topics view of a paper (by clicking on the Topics drop down menu in the Topics bar and selecting the topic they would like to view) -or- on the front page of your paper next to any topic heading. 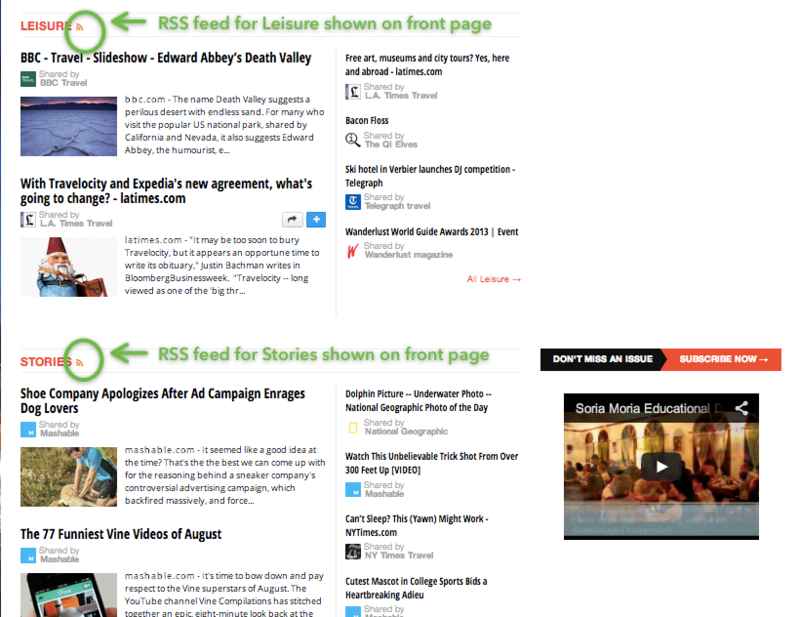 Front page example: RSS for a topic is available on the front page of your paper next to any topic heading. Using the Paper.li News Page App on your WIX site? All layout and color controls are found by accessing your WIX page settings. Click anywhere on the body of your Newspaper to see Settings button, shown below. From there, you can edit the text color, choose a font, and choose a general color scheme. Although you view your WIX Newspaper in your favorite RSS reader (URL found under General Settings, described above), you will not be able to offer the RSS feed to your readers. Haven't taken the Pro plunge yet? Learn more about what you can do with our knock-out $9 USD/month Pro Plan. Go PRO!